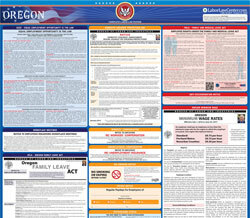 The Oregon's Smoke free Workplace Law is an anti-smoking law poster by the Oregon Bureau Of Labor and Industry. This is an optional poster, so while it is recommended that you post this if it is relevant to your employees, you are not required to by the Bureau Of Labor and Industry. This poster is optional to post and describes the limits of the right to smoke, how to comply with the law and how the law is enforced. It appears you don't have a PDF plugin for this browser. Please see the link below to download oregon-large-english.pdf.